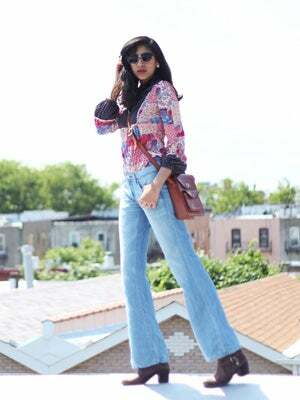 Bell-bottoms have experienced a resurgence in popularity lately — and I’m loving it. I first remember rocking flared jeans in middle school. Now a decade later, they’re back in my closet. I paired my light-wash jeans with a vintage dress that I wore as a blouse for a totally retro look. On a different day, I might wear a simple, crisp white blouse instead. The thing about flares is that they are versatile enough to be dressed up or down, so the ways to wear them are endless. How do you wear yours? Vintage dress worn as blouse, vintage bag, Uniqlo jeans, Urban Outfitters sunglasses, Diesel boots.